I believe I’ve said before that I’m a big snare drum fan, so when something new lands in front of me that is a bit different and I haven’t seen or tried before, I get enthused. 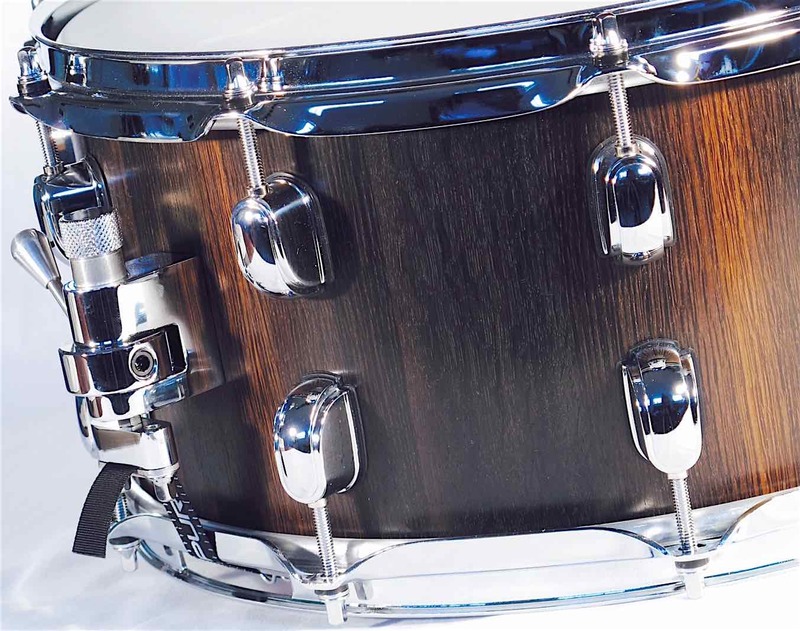 This particular snare drum has been made by a new British company called, as you’ll have seen, RePercussion Drums, and it’s from their SubTerranean series. There’s a separate feature here on the company itself to give you some background on it. The shell is made from English bog oak dated at around 5,000 years old. Due to the stave construction and nature of the wood, it visually looks a mixture of milk and dark chocolate in colour. The overall build quality was really good and I couldn’t find anything negative to say about it. The stave shell gives the drum plenty of facility in the volume department. It also has triple flanged hoops, a Trick GS007 strainer and Puresound wires. Quality stuff which tick all the boxes for me. 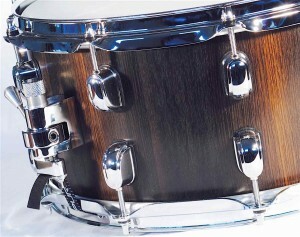 The review drum was built out using Tama lugs, which was done on a cost/practical basis until such time the company can produce its own design and hardware. Whilst these lugs do potentially take away a little individuality if you recognize them, it’s only a minor thing. What gives the drum any lost identity back though is the pretty unique badge, which is made from 8mm sterling silver and goes right through the shell. Sonically, I tried the drum at a few different tensions and it worked for me at all of them. At a lower tension the drum was fat, tuned up, it was tight and crisp, and in the middle it felt like it would probably sound good doing anything. This drum was also recently used at Real World studios in the UK where apparently it was very well received. All in all, as an initial offering, I can’t help thinking there’s good things to come going forward. This is an excellent snare drum in my opinion and it was great fun to play. The drum also looks interesting and has a cool backstory to it as well.